November has passed totally immersed in artistic activity; this month I have been collaborating with American artist S.E. Barnet and Mexican artist Fernando León-Guiu on a performance of team proof-reading, filmed for Barnet’s forthcoming show at Five Years Gallery in London. Therefore there is no November review from Viewer Review. The following text is the press release for the exhibition. The second in a series of two exhibitions on making marks and meaning. A day of continual irritation for myself* presents a filmed performance of the team proof-reading activity begun during the exhibition General title given by myself at Five Years in July. 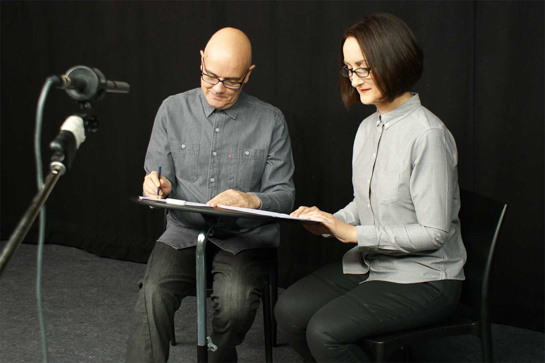 The proofreaders are enacted by Mexican artist Fernando León-Guiu and writer France León. The pair are based on a couple well known throughout the publishing world for their facility and formality. The starting point for all this activity comes from the Day Surveys of 1937-1939 from the Mass Observation archive. This British movement begun in the early 20th century, aimed to create “an anthropology of ourselves” by recording everyday life in Britain through a panel of untrained volunteer observers who either maintained diaries or replied to open-ended questionnaires. These observers acted as recorders, attempting to capture the everyday details of their own lives and the lives of those around them. This work with the Mass Observation archive employs these materials towards re-appropriation and détournement. The engagement involves a number of activities from extensive transcription, to the creation of drawings, through scripts for performance and film, to daily tweets. The exposure of current extensive state-run mass surveillance predominates this undertaking. The project offers a look at early complicit engagement with surveillance and the relationship between diaristic self-exposure with the resultant surfeit material. There will be an Open Conversation on 7 December from 3 p.m. In response to questions raised by Marking Language, currently at the Drawing Room, and General title given by myself, at Five Years last July 2013, Barnet and Morfill offer an Open Conversation engaged with the look of words and the meaning of marks. 7 December – 15 December 2013 | Preview: Friday 6 December 6 – 9 p.m.